On December 26, 1919, Civil War soldier, planter and politician William Ruffin Cox died in Richmond, Virginia. Born in Scotland Neck in 1832, Cox was raised and educated in Nashville, Tennessee. In 1857, he returned to North Carolina, where he owned a large plantation in Edgecombe County and established a law practice in Raleigh. 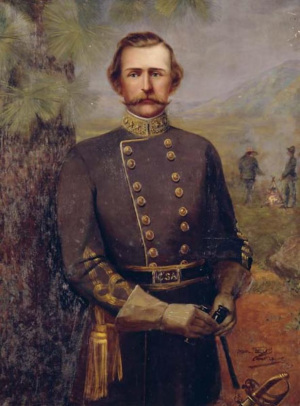 During the Civil War, Cox was successively major, lieutenant colonel and colonel of the 2nd Regiment North Carolina State Troops. In 1864, he was promoted to temporary brigadier general. Cox’s Brigade was credited in postwar North Carolina lore as having fired the last shots by a unit of the Army of Northern Virginia at Appomattox. After the war, Cox became active in politics. As chairman of the State Democratic Executive Committee in the mid-1870s, he played a major role in the downfall of Reconstruction in North Carolina. He was subsequently appointed a Superior Court judge. From 1881 to 1887, Cox represented several Piedmont counties in Congress, where he was a supporter of civil service reform. From 1893 until 1900, Cox was secretary for the United States Senate. He was also a prominent speaker and writer on Confederate topics. Cox is buried in Raleigh’s Oakwood Cemetery.